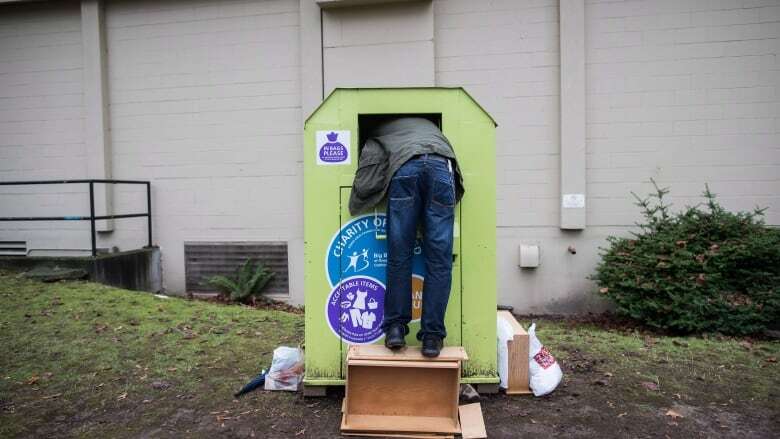 A homeless shelter in Vancouver is calling on charities to remove their sometimes deadly clothing donation bins from the streets until a safer design can be implemented. 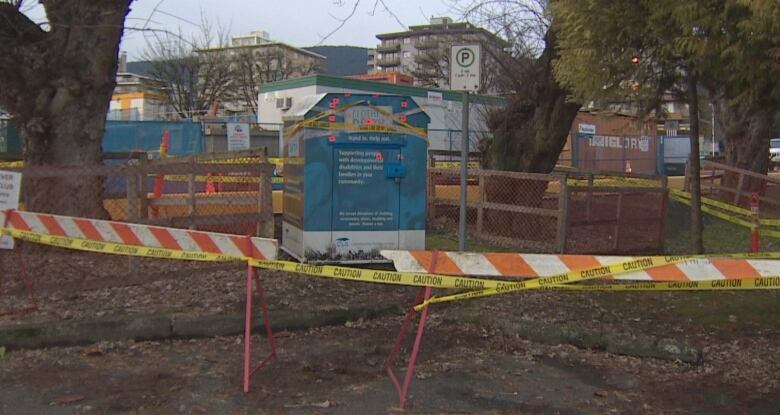 Update: After this story was published, the District of West Vancouver announced it would temporarily remove its donation bins from the streets until it can make "the necessary changes to ensure Sunday's tragic ... doesn't't happen again." A homeless shelter in Vancouver is calling on charities to remove their sometimes deadly donation bins from the streets until a safer design can be implemented. A 34-year-old man is dead after he was found stuck in a clothing donation bin in West Vancouver on Sunday morning. He is the second person to die in such a bin in the Greater Vancouver area in 2018, and the fourth since 2015. While the design of these bins varies, most have hatches to protect donations from pests or thieves — but if a person gets trapped in the mechanism, they can be constricted and killed. Nicole Mucci, spokesperson for Union Gospel Mission in Vancouver, says it's time for that change. Here is part of her conversation with As It Happens guest host Helen Mann. There are hundreds of clothing donation bins in Vancouver. What would you like to see happen to them? We really hoping that until some redesign or slight change has been made to these bins, that they can be recalled. If this was a product that our general population used on a daily basis, like a toy or a coffee machine, they would have been pulled off the shelves with the first serious injury or death. Our most vulnerable population right now is at risk, and something needs to change. When you heard that this man was found dead in a bin on Sunday, given how, you know, you've been speaking out about this for some time, what went through your mind? It was just a really devastating way to end 2018. It's beyond comprehension that we weren't even able to stop one of the members of our most vulnerable population from dying on New Year's Eve. Why do you imagine he entered that bin to begin with? Oftentimes, what we're seeing is that members of our community, when they do get really cold, they end up searching for something to keep them warm. And if they walk by one of these bins and they see them, they know that this is where people drop off their textiles, it's where they drop off warm blanket, old coats, that sort of thing. And often, if it's really windy, if they're able to get inside one of those bins, they also offer like a barrier and protection from the wind and from the elements. Should they be banned altogether? We believe that these bins shouldn't have to be banned. It's simply a redesign. We believe in the best in people. We believe in the best in these organizations. Many of these organizations are trying to change the world in their own positive way as well. If they take the bins off the streets just for a little while, then they could be they could re-enter society more safely and they could continue to serve their purpose. Who should take responsibility, given that we're talking about people dying? One death is too many deaths and we think that this is a perfect opportunity for these organizations, if they would like to, to step up to and to take these bins off the streets and to redesign it to make them safer. Do you think it's time this city get involved, possibly even the province, to force the charities to act? I think there is an opportunity right now for these organizations, these manufacturers to choose to prevent these deaths from happening in the future. What kinds of steps are you taking to try and see these particular types of bins not used anymore? Our organization actually put out a call for collaboration and creation in July after Svetlana's death in the west end in July, and we were actually connected with Professor [Ray] Taheri, at UBC Okanagan. He is an engineering professor there and he was just gutted to hear about the loss of the young woman's life and he actually wrote it into his engineering first-year students' curriculum to create redesigns. Has he told you what kind of progress they're making? They've actually made some pretty incredible progress. First-year students actually presented all of their designs to a panel of different judges, so different architects and engineers and industry experts, at the beginning of December. And he's building into his curriculum for January that fourth-year students take and refine it and further develop these designs. Is there anything you can do to get the word out to people living on the streets that they should not be entering these bins, that it's a danger to them? Our outreach team works very closely with people every single day. Whenever we see them, if they have, you know, a need, we actually try to provide those clothing or warm shoes or whatever it is that they need. And we do share with them the dangers. But as a community, I think we all need to collectively figure out a way to make sure that our vulnerable population is protected. Written by Sheena Goodyear with files from CBC News. Interview produced by Jeanne Armstrong. Q&A has been edited for length and clarity. A previous version of this article stated that there were two deaths related to donation bins in West Vancouver in 2018. In fact, there was one death in West Vancouver and one in the City of Vancouver.